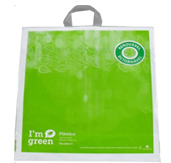 The bags produced with BASF Ecoflex® biodegradable plastic, are an alternative in relation to conventional plastic. During their decomposition, Ecoflex® behaves as a normal organic compost. The microorganisms present in the soil degrade Ecoflex® completely. According to standard ASTM D6400 about biodegradability, it is all material which organic content become humus, water, CO2 and Biomass in up to 180 Days (standard time for 120 micra thickness films in a compostable environment). The benefit of this produce s that it helps balance the carbon cycle due to having in its composition a renewable source raw material (cornstarch), in this cycle the period of consumption, disposal and decomposition of the final product is balanced in relation to the raw material production time. We are concerned with applying totally biodegradable raw material. According to standards NBR 15448-1/2, ASTM D 6400 and EN 13432. They should have the "Compostable" seal issued by the BPI, Biodegradable Products Institute of the USA. Starch is a natural polymer, which after processing, becomes a biodegradable polymer that can be used in applications such as films and flexible packages, for example. The Returnable Bags made with Green Polyethylene by Braskem, coming from Brazilian sugarcane ethanol, a renewable source, promote the CO2 emission reduction. The sustainable balance of green plastic shows that for each ton of green polyethylene up to 2.5 tons of CO2 are captured and set from the atmosphere. Another advantage is that the green plastic is 100% recyclable, within the existing current processes. Since polyethylene is a material with high added value, the recyclability is a very important characteristic, because it makes the reuse of the material numerous times possible. Green PE is not biodegradable, thus the CO2 captured during the sugarcane harvest remains set for the entire life period of the plastic. In 2011 the green PE by Braskem received the maximum certification from Belgian company Vinçotte, main institution of evaluation of products with renewable origin content. The analysis considered samples from HDPE (High Density Polyethylene) and LLDPE (Linear Low Density Polyethylene) families. All the grids received four stars, attribution of maximum quality granted by Vinçotte. Until April 2014 Braskem green polyethylene will use the 'Ok Biobased' seal. Extrusa-Pack is a partner of this idea! Get to know the Institute. Besides this it is adding the "4th R"
Click here and see this project.